There are several things to consider when constructing a new parking lot design or revamping your existing parking lot layout to achieve functionality, aesthetic appeal, and safety. The most important aspect of formulating a new parking lot design is planning properly. The best design for your lot will rely heavily on the purpose of your lot. Is it a retail lot, an office building, or a condominium complex, etc.? Each scenario will offer different needs and different traffic patterns/densities. For example, a parking lot that sees continued shipments from heavy vehicles will likely need to be constructed differently in thickness, design, and general layout than a residential condominium lot. Three areas of parking lot design that will vary based on the lot’s purpose are; size, thickness, and parking space layout. Parking spaces are typically angled differently to accommodate different types of traffic. 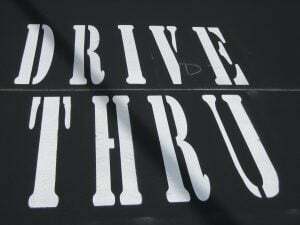 Another example of unique functionality and design elements is if your business offers a drive thru window option like a fast-food facility, or a bank. Establishing first how many parking spots are typically recommended for your industry is important. 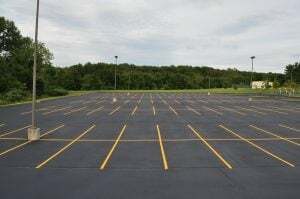 Getting an idea of how many spaces your lot will need for your type of facility/business will not only help to create a starting point for your plan, but it will also help to determine other (less essential) possibilities to add to your parking lot design. 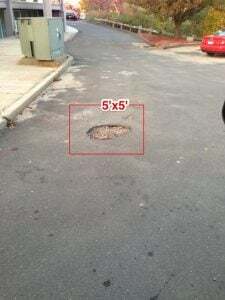 Once number of spots needed is determined, the size of each space will need to be established (this will also vary based on the type of traffic expected). Additionally, ADA regulations need to be a large part of your spacing consideration during the planning phase (signage, number of accessible spaces for size of lot, van accessibility, accessible isle, etc.). Consider all of this before you begin your parking lot design blueprint. The last thing you want is for your parking lot to deter customers and/or actually lose you money. If traffic flow and traffic markings that indicate the flow in your lot are ineffective, not visible, or cause “traffic jams”, those visiting your location will likely dread parking and this could result in customers not returning. Traffic directions should be clearly indicated in the most effective and safe way possible with signage, asphalt pavement markings, and parking barriers. Signage and markings include, yield and stop signs, crosswalks, accessible markings, traffic arrows, drive-thru directions, one-way signs, etc. During the parking lot design phase, safety should be at the top of your list of priorities. Safety encompasses several things, including the ADA and traffic flow directions and markings mentioned above, but also additional elements like lighting. If your lot is not properly lit, this could lead to potential for dangerous circumstances at night and/or customers feeling uncomfortable. But, your lighting should also be safe for night driving (avoid glare or visibility issues for drivers – angling lights downward will help with this). Additional accessible safety measures to consider are access ramp elevations, and potential barriers within an accessible path. Also consider future maintenances associated with asphalt repair needs that if left untreated could be potentially dangerous. Not only do you want to consider a future maintenance plan to ensure safety of those frequenting your lot, but also to ensure that you are getting the most out of your parking lot asphalt paving investment. Failing to account for a repair and maintenance plan can result in unnecessary damages and costs associated with these injuries. Asphalt repair is extremely cost effective when considering the low cost vs. high benefits of these practices. Aside from protection of travelers and your asphalt itself, asphalt repair and maintenance also helps to keep your facility looking fresh and increase its curb appeal, overall increasing value! Having a well-constructed parking lot design that is overall effective, functional, appealing, and safe is extremely important. When hiring a paving contractor to tackle a new design, or a re-design, it is important to hire one with commercial paving experience. Our highly trained and high knowledgeable staff at EastCoat Pavement specializes in commercial asphalt paving and parking lot design. So, when hiring us, you can feel confident in relying on our expertise to construct a parking lot design that is not only ideal for your specific needs, but one that also meets all of the above requirements and considerations. Contact us today for your free parking lot consultation!